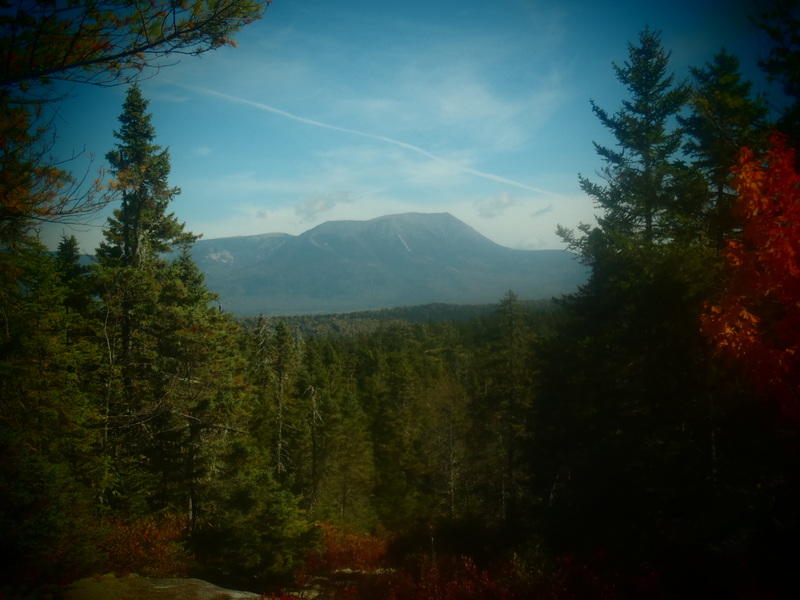 The infamous 100 Mile Wilderness of northern Maine, the only thing standing between us and the base of Mt Katahdin. What is the 100 Mile? It is advertised as an isolated and remote stretch of virgin wilderness through marshy moose bog habitat with easy rolling terrain connecting pristine lakes. The idea of hiking completely through this section originated almost a century ago in connecting several hunting camps situated only a day apart. As time passed the hunting camps slowly disappeared and the 100 mile experience changed from something geared toward the upscale outdoorsman to a rugged, self reliant wilderness trek. The foreboding reputation of this section of the Appalachian Trail has created a sense of fear and anxiety amongst the pool of modern AT Thru Hikers and it has now become an almost impassable barrier. Mentally at least. With communication technology developing and an influx of thru-hikers with greater disposable cash, the 100 mile has morphed once again to something different. 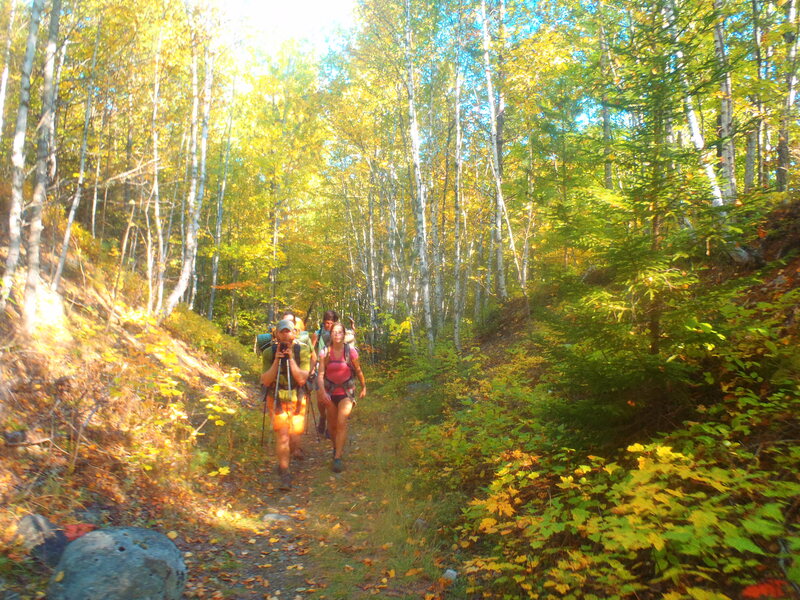 The distance between Monson, Maine and the Golden Road on the boundary of Baxter State Park is still 100 miles but the mystique of a true wilderness experience has become a thing of the past. Located on the bronze placard fixed to a boulder on Springer Mountain, GA, the southern terminus of the Appalachian Trail, is the phrase “A footpath for those who seek fellowship with the wilderness”. This is how the father and pioneer of the AT, Benton MacKaye, viewed the trail that would run 2,000+ unbroken miles through the Appalachian Mountains of the eastern United States. 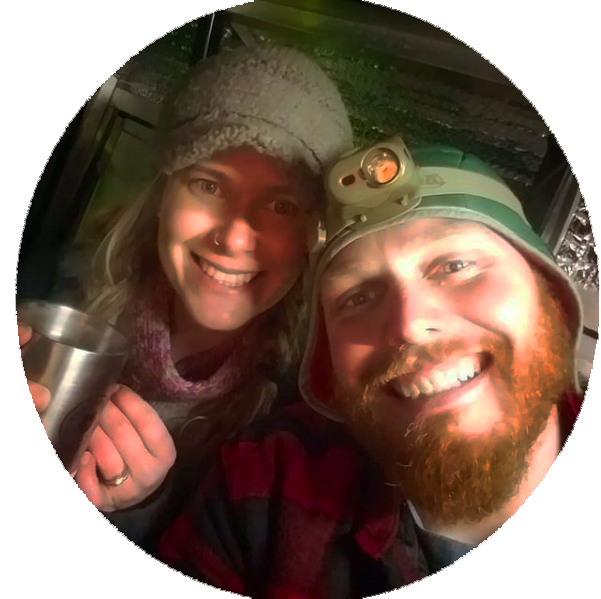 Regardless of the year or personal motivation, almost every hiker that has attempted a thru hike has some idealistic view of shedding the bonds of modern society and reconnecting with nature at a primal level. The world has obviously changed since Earl Shaffer first accomplished the feat of thru hiking in 1948. It would be fair to say that in the 1930s MacKaye could not conceptualize almost a century of technologic advances, not to mention the affect of iPhones and 3G on the trail. Society has steadily encroached on the wilderness that the AT was designed to embody and all of the “National Wilderness” or “National Forest” designations in the world can not stop the unrelenting shrinking of the physical and ideological AT wilderness. This past summer we hiked 2,185 miles through the forest, but it was a forest with paved roads every fifteen miles, farming or logging operations just 100yds on either side of a corridor, and the ever essential cell phone service. The wilderness experience that I, somewhat foolishly and ideologically, expected to have never did come. We were truly just connecting a bunch of day hikes that someone could, and did, do by car for 2,185 miles. That’s why the 100 Mile Wilderness did not make me apprehensive, rather I enthusiastically loaded up my backpack with 6+ days of food and struck off out of Monson with my 55+ lbs of food and gear to go and hike the wilderness in the only way I thought it could be done. 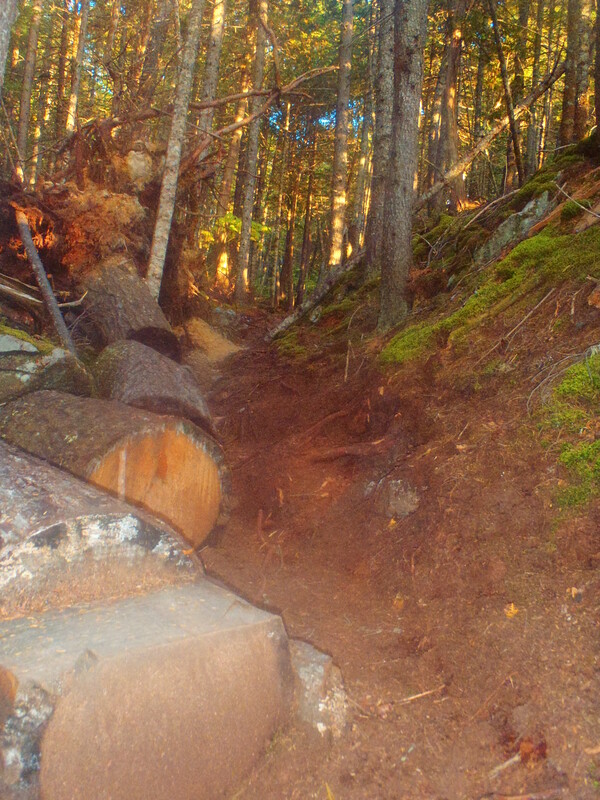 A dead tree fell parallel into the trail and set up an awesome fall photo possibility. Actually, that in itself if a lie. The wool had been pulled from my eyes when we walked into Monson and literally dozens of hikers were busily figuring out any way possible to make the challenge of the 100 Mile Wilderness more manageable. The easiest, cheapest and most logical way involved taking a 5 gallon jug and filling it with a resupply and paying $25 to have it dropped off 2/3 of the way in. 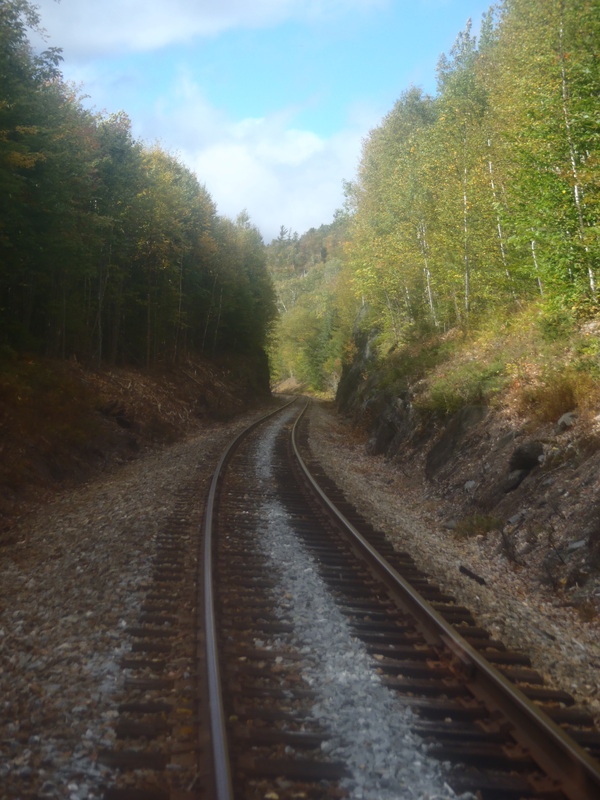 But the possibilities ranged from the 5 gallon jug to a complex system of slack packing and gear drop offs which utilized a spider web of dirt logging roads through the remote Maine forest. I can understand the food drop, not everyone hiking the trail is 27 years old and in relatively decent shape like Lindsay and I nor does everyone want to hike 15 to 20 miles/day their last week on the trail, and a food drop allows someone to go a bit slower with less stress. What I couldn’t understand was the slack packing. Slack packing shouldn’t bother me. Lindsay and I slacked for 230 miles, from New York to Vermont. Now this was the first time I had resentment toward the people slack packing and it took a while to figure out why. Admittedly I felt very hypocritical. It all goes back to what was inscribed on the plaque on Springer Mountain. “A footpath for those who seek fellowship with the wilderness”. This was the last remaining bastion of wilderness on the Appalachian Trail and people were willing to spend hundreds of dollars per person to make sure it didn’t stay that way. 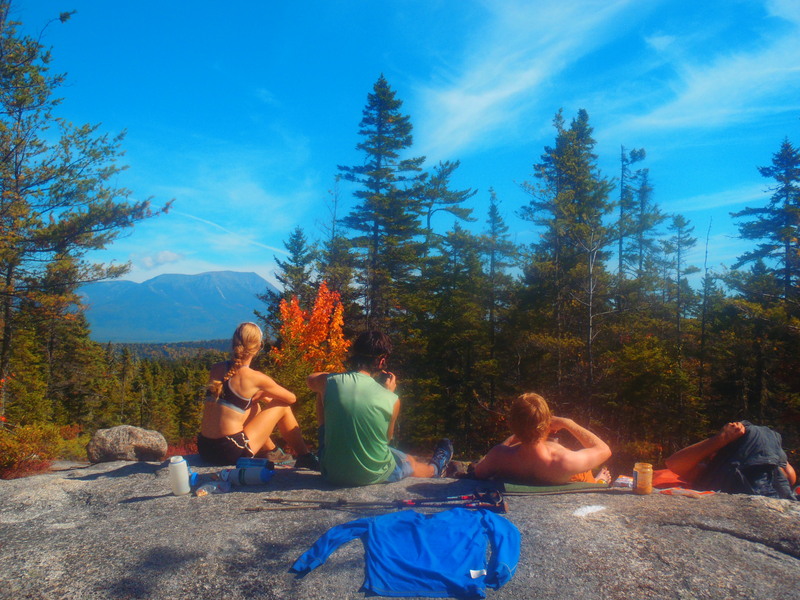 Out of all the people we met between Monson and Baxter State Park, we were the only group of people that hiked the 100 Mile the traditional way, meaning no shuttles, no gear drops, no food buckets, nor simply just skipping it by taking a car around. I’m not writing this to brag. Rather I’m trying to illustrate that out of the four dozen, or so, people we met in the last week, no one was comfortable with simply filling their pack with food, putting it on their back and heading off into the forest. One group of people that we met willingly paid an exorbitant amount for a shuttle to drive them two hours each way from the nearest town so that they could sleep in a bed at night and not have to carry food. Yes, that’s an extreme case, but what is so wrong with just hiking and sleeping in the woods? Not everyone sees it the same way I do, and I understand. I understand it’s easier and more comfortable to not carry a pack. I understand that people have injuries, but we all were injured on way or another after 2,100 miles. With that I ask you to understand that some people are still out there trying to experience something that is only just an idea now. But when you’re updating your Facebook status waiting for your shuttle to pick you up at after slack packing for the day, at least have the courtesy to step off the trail and not make me wait for you to get done typing and put your phone away. Mt Katahdin from the northern side of the 100 Mile Wilderness, our last real view of the mountain before we were on top of it. I realized my resentment could better be described as disappointment. 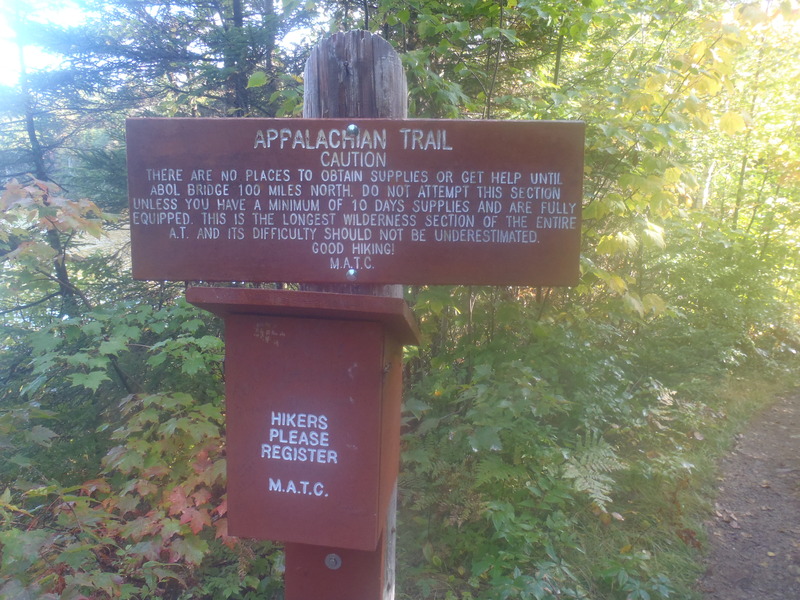 I was honestly disappointed that I was sharing this experience, the exact reason the Appalachian Trail was conceived, with people that were willing to do anything to avoid the hardships of being in the wilderness. Even after I’ve finished my hike I look back and don’t understand why someone would endure months of blisters, rain, sweat, mud, blood and tears on an undertaking they fundamentally can’t embrace. In the end it was still five days of hiking through beautiful terrain, much of it being the flattest and easiest hiking we had on the entire trail. The 100 Mile Wilderness was a fitting end to our adventure, like a school essay it did a rather fitting job of summarizing 2,000 miles of experiences into a concise package. We had mud and gravel, roots and rocks, well graded walking and granite slab scrambling. We filtered water out of glorified mud puddles and drank straight from crystal clear springs. The uphills were just as rugged as anywhere else on the trail and as always our elevation guide seemed to be a little less than accurate. We had sunny afternoons and cool evenings, perfect for an evening campfire to sit, reflect and tell stories of a summer gone by. It’s a place I’d gladly go back to and experience again the beauty of this section, just not during non-peak season, without the tunnel vision of a sinus infection and without the blinding drive to finish a thru hike!